Red sky at night, sailors delight...so pink sky is still pretty good, no? 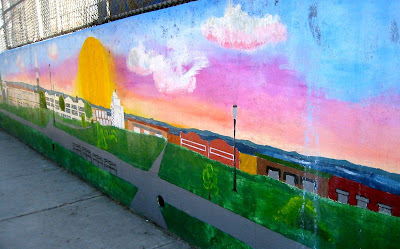 This mural is on the Third Avenue wall of the Charles O. Dewey school and playground courts. It's one of many murals that decorate various walls around the school's backside. It depicts the western view from Sunset Park itself. The colors are pretty intense; I like that even the clouds are tinged in pink. Somehow after 30+ yrs in Bklyn, I finally moved four years back, to Sunset Park. One walk to the park and I knew no Brooklyn vista could be better. Glad your covering it. I love this Mural. CFL Life Lines program out did themselves. If interested in more Murals around sunset, as-well-as other Art projects stop by my blog buendiaproductions.blogspot.com There are several other murals, performances, galleries and projects coming up soon. If your interested in the Details please let me know. I'm a teacher and artist that work with many different organizations around sunset.